Three busy days on exposing science to curious visitors. in school teams of typically one teacher and 2-3 students. up to (predominantly) high school (about 18 years old). Das Teleskop besitzt einen Antennendurchmesser von 28 Metern und sah am 26. Juli "erstes Licht". und Gérard Fontaine (Chair des H.E.S.S. Collaboration Board). Auf dem 7. Treffen "Astroteilchenphysik in Deutschland" wurde der aktuelle Stand der Astroteilchenphysik und ihre zukünftige Entwicklung diskutiert. Im Vordergrund stand dabei die Beteiligung deutscher Forschungsgruppen und Institute an gegenwärtigen und geplanten internationalen Experimenten. Der Themenbereich überdeckte die Gamma-Astronomie, die Physik der kosmischen Strahlung, Neutrino-Astrophysik, Neutrinomassen, Dunkle Materie, Kosmologie und Gravitationswellen. Die vorangegangenen Workshops fanden 1999 und 2001 in Zeuthen statt, 2003 in Karlsruhe, 2005 wieder in Zeuthen, 2007 als "Symposium für Astroteilchenphysik" zusammen mit der Herbsttagung der Astronomischen Gesellschaft in Würzburg und 2010 zum vierten Mal in Zeuthen. Das Treffen wurde vom Komitee für Astroteilchenphysik (KAT) als Vertretung der Astroteilchenphysiker in Deutschland, der Helmoltz-Allianz für Astroteilchenphysik (HAP), dem Bundesministerium für Bildung und Forschung (BMBF) sowie von DESY als gastgebendem Institut veranstaltet. Die Pressemitteilung von DESY kann hier heruntergeladen werden. Die Zeremonie hat in HAP erste general Treffung in DESY Zeuthen am 19 September 2012 stattgefunden. Das Programm wurde auf Beschluss der Mitgliederversammlung von HAP eingerichtet. 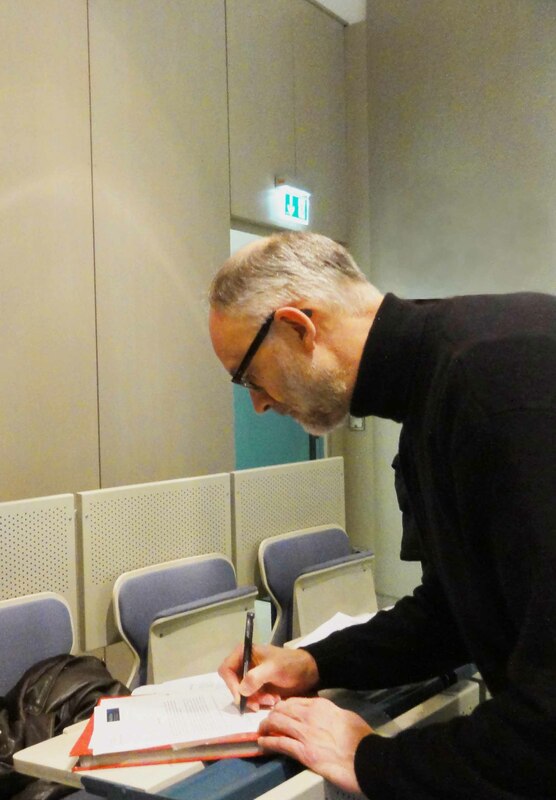 Die Auszeichnung ist mit einem frei verwendbaren Betrag, Reisemittel für Konferenzen und Schulen im Zusammenhang mit HAP sowie mit Fördermöglichkeiten von wissenschaftlichen Vorhaben aus Mitteln der Allianz verbunden. Jede von die Wissenschaftler hat eine Gespräch gehaltet für ein beliebiges Thema. Prof.Dr. Peter L. Biermann - "The first cosmic rays"
Dr. Hans Otto Klages - "Selected Highlight Results from the Pierre Auger Observatory"
Prof. Dr. Ernst Otten - "The Long Way to KATRIN"
So können die anerkannten Wissenschaftler weiter in die aktuelle Forschung eingebunden bleiben und ihr über Jahrzehnte angesammeltes Wissen weitere einsetzen. Das Förderinstrument dient darüber hinaus der weitere Vernetzung und Profilierung der Allianz. 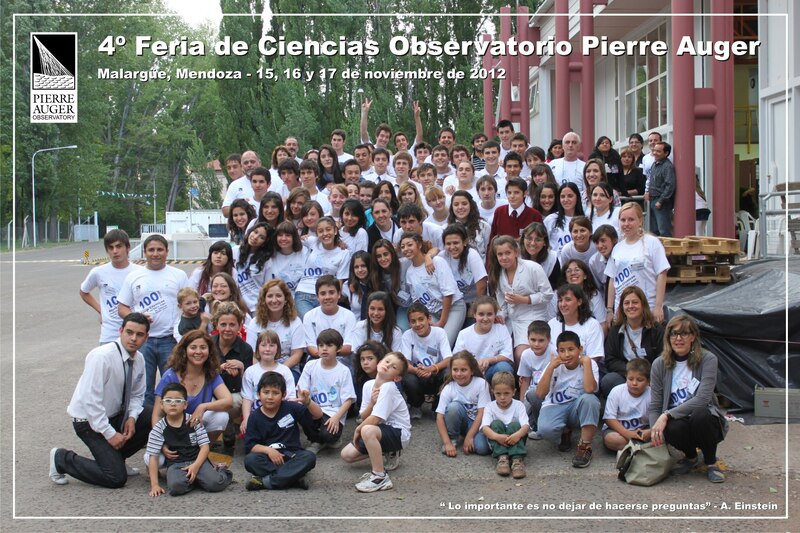 On July, 26 2012, scientists of the H.E.S.S. (High Energy Stereoscopic System) collaboration announced that the H.E.S.S. 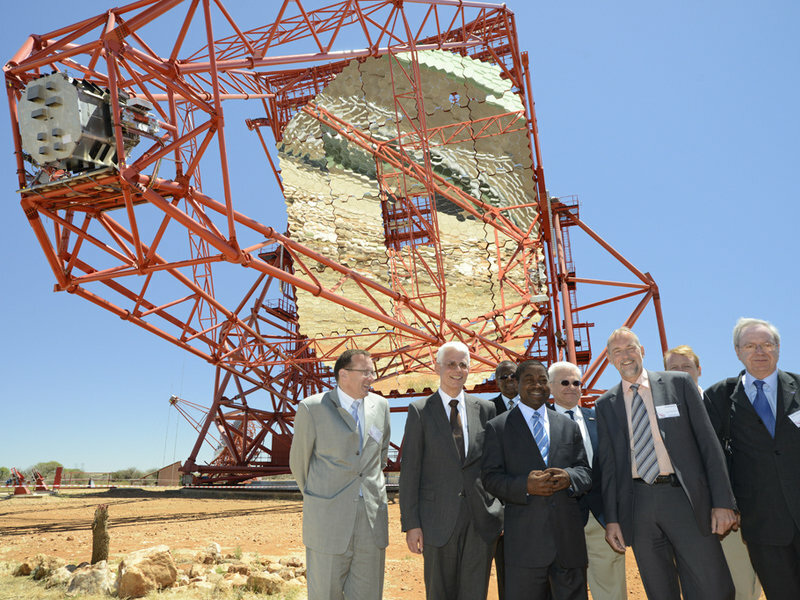 II telescope has started operation in Namibia. Made of a segmented mirror 24 meters wide and 32 meters tall, equal in area to two tennis courts, the H.E.S.S. II telescope is the largest Cherenkov telescope ever built. "After two years working for H.E.S.S., it finally is! ", smiles Arnim Balzer, HAP member and PhD student within the H.E.S.S. group at the University of Potsdam and working at DESY. Recorded this first signal was not a straightforward story, three campaigns of a fortnight were necessary. "I've been there three times in May, June and July", Arnim explains, "As I'm responsible for the data acquisition (DAQ), I was there in May to help integrating the tracking system into the DAQ". So far the telescope could move from a position to another, but it was unable to follow objects in the sky in an automatic way. "In June, we tested the camera of the telescope to see if it survived the transport. And in July was the first light campaign." Experts in camera electronics, camera software, central trigger and DAQ from the participating institutes in France and the MPI in Heidelberg were on site to manage to take the first data. "It was a bit before the press release" tells Arnim. When the telescope was finally ready and fixed, "we had the last ten minutes of dark time to manage to take some data before the moon was rising. It was around midnight, and then it was a nice evening partying up to 3-4 o'clock to celebrate", he recalls, "Every time Namibia is a lot of work, but moments like that pay off". dramatically improved intensity and resolution with which H.E.S.S. II views the particle cascades. The H.E.S.S. I cameras are shown in reduced size. The H.E.S.S. observatory is operated by a collaboration of more than 170 scientists, from 32 scientific institutions and 12 different countries. The H.E.S.S experts on site for the first light campaign were, from left to right: François Toussnel, Camera Hardware expert, LPNHE Jussieu ; Michael Gajdus, DAQ expert, HU Berlin ; Mathieu de Naurois, Camera Software and DAQ expert, LLR Ecole Polytechnique ; Arnim Balzer, (primary) DAQ expert, Uni Potsdam ; François Brun Central Trigger Expert MPI-K Heidelberg. H.E.S.S. is a system of Imaging Atmospheric Cherenkov Telescopes that investigates cosmic gamma rays in the energy range from tens of GeV to tens of TeV. Together with the four smaller (12 meter) telescopes already in operation since 2004, the H.E.S.S. II telescope is dedicated to observing the most violent and extreme phenomena of the Universe in very high energy gamma-rays. On the contrary of most ground-based telescopes with lenses and mirrors, the H.E.S.S. telescopes are designed to detect gamma rays - photons with over 100 billion times the energy of visible light - and actually requires the atmosphere to operate. As the gamma rays impact the upper atmosphere they produce air showers of high-energy particles, which emit brief flashes of optical light, called cherenkov light. This light is recorded by a large camera at the mirror's focus and provide multiple stereoscopic views of the air showers, relating them to the energies and directions of the incoming cosmic gamma rays. H.E.S.S. I telescopes observed the celestial object KUV 00311-1938 between 2009 and 2011 for a total of 52.5 hours of good quality data, the currently most distant source of very high energy gamma rays. Scientists from the XENON collaboration announced a new result from their search for dark matter. The analysis of data taken with the XENON100 detector during 13 months of operation at the Gran Sasso Laboratory (Italy) provided no evidence for the existence of Weakly Interacting Massive Particles (WIMPs), the leading dark matter candidates. Two events being observed are statistically consistent with one expected event from background radiation. "Although we were of course rooting for a detection," Uwe Oberlack, HAP member and leader of the XENON group at Uni Mainz, says, "it is important to emphasize that not finding a signal is not a "failure", as sometimes misunderstood in public media. Rather, limits are an essential way of advancing our knowledge." 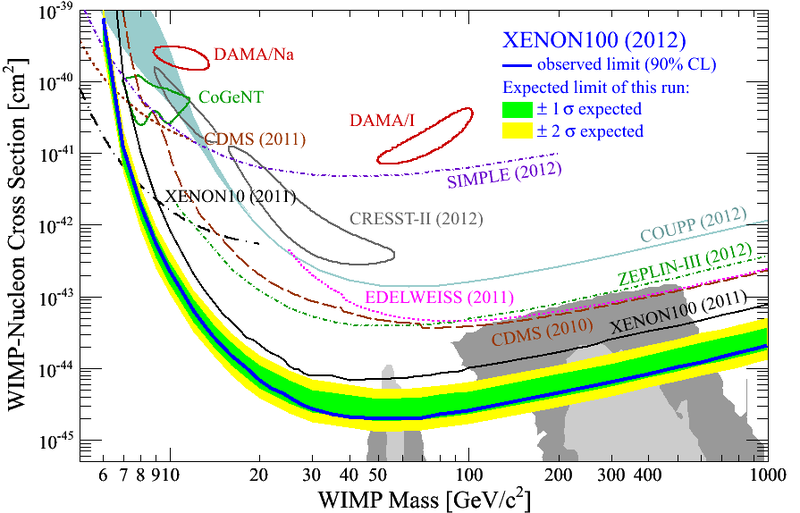 "With the new result, XENON100 has reached much farther than anybody else into so far unexplored range of the WIMP Dark Matter parameter space in the "standard" WIMP mass range," continues Oberlack. Compared to their previous 2011 result, the new data improve the bounds to 2.0×10-45 cm2 for elastic interaction of a WIMP mass of 50 GeV, which means an improvement in sensitivity by a factor of 3.5. "XENON100 is now a factor of ~20 ahead of the competition in direct searches, and is providing complementary limits to LHC results especially on minimal supersymmetric (SUSY) models." "My XENON colleagues and I are very content about the fact that we have now reached our design sensitivity and are providing input to our theoretical colleagues that are complementary with LHC limits on SUSY," Oberlack says, "XENON100 has reached a factor of ~50 beyond the sensitivity of its predecessor XENON10." Measurements with XENON100 will continue, but the next generation experiment, XENON1T, is already on its way. "Construction will start in the fall, and we plan to start data taking early 2015. XENON1T will advance sensitivity by another two orders of magnitude, reaching deep into remaining WIMP parameter space," Oberlack concludes. Continued measurements with XENON100 and the new experiment XENON1T, should either find evidence for WIMPs or other forms of dark matter would have to be considered. XENON100 is a direct dark matter search ultra-sensitive device using 62 kg of liquid, ultra-pure xenon as a target for the WIMP, the weakly interactive massive particle and best candidate for dark matter. 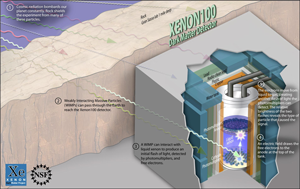 XENON100 measures the tiny charge and light signals that are expected from rare collisions between WIMPs and the nuclei of xenon atoms. In order to shield it from cosmic rays which constantly bombard the Earth, the detector is operated deep underground at the Gran Sasso National Laboratory of the INFN, in Italy. The detector is in addition shielded by specially designed layers of copper, polyethylene, lead and water, to reduce the background noise even further. And to avoid false events due to residual radiation from the detector's surroundings, only data from the inner 34 kg of liquid xenon are taken as candidate events. 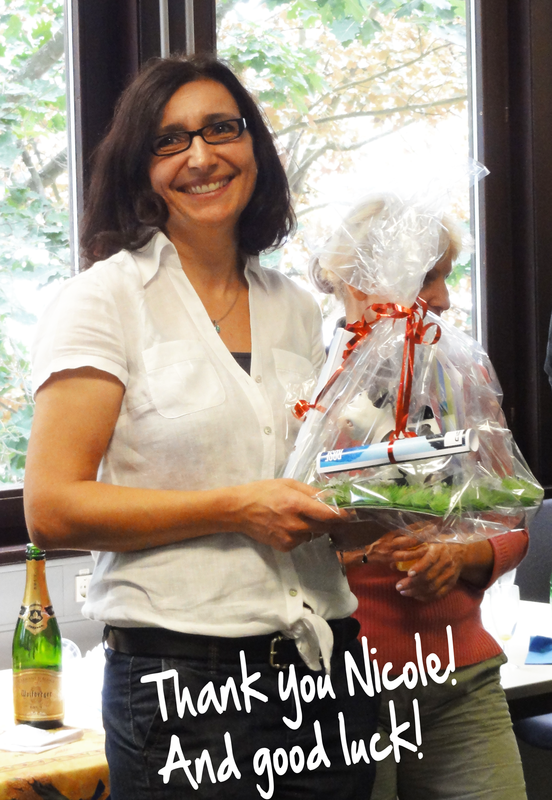 19.07.2012 - Goodbye Nicole! Welcome Bianca! Nicole Keller-Rau (on left), the administrative coordinator of HAP, is leaving us for the KIT scientific council. Thanks Nicole for your great work within HAP! 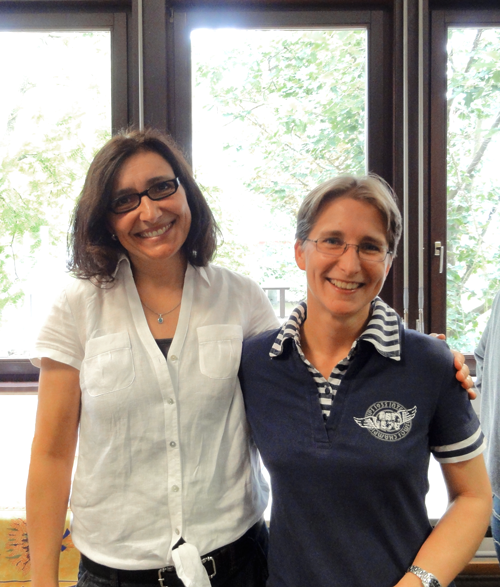 Congratulations to Dr. Bianca Keilhauer (on right), our new administrative coordinator! 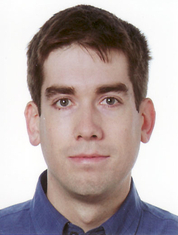 The astroparticle physicist Dr. Frank Schröder (KIT) earns the "Dissertationspreis der Fachverbände Gravitation und Relativitätstheorie, Physik der Hadronen und Kerne, Teilchenphysik 2012" of the German Physics Society DPG for his work Instruments and Methods for the Radio Detection of High Energy Cosmic Rays. 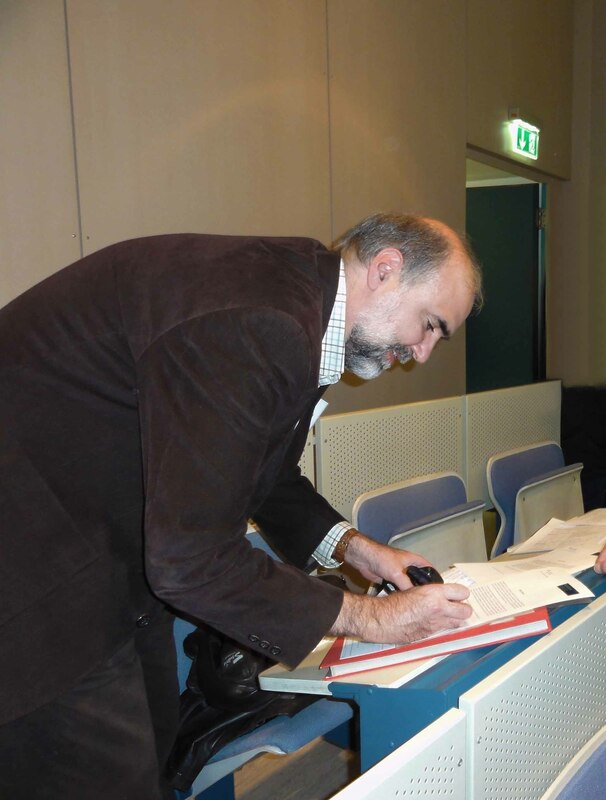 Dr. Frank Schröder was also the winner of the ECRS (European Cosmic Ray Symposium) prize for young scientists, where the diploma is signed by Sir Arnold Wolfendale and Mikhael Panasyuk. He got the award for his contributions to the development of the radio air shower detection technique of UHECR. and for the second time the Cluster of Excellence "Fundamental physics: Origins and structure of the Universe" (Universe Cluster) - Technische Universität München. A complete list of approved Graduate Schools and Clusters of Excellence can be found here, together with a map here. On 04/05/12, the Helmholtz Aliance for Astroparticle Physics has welcomed as new associated partner the Institute of Technology in Detection and Astroparticles (Instituto de Tecnologías en Detección y Astropartículas – ITeDA) of Buenos Aires, Argentina. ITeDA is the leading research institute in astroparticle physics in Argentina. ITeDA was created jointly by the National Atomic-Energy Commission (CNEA), the National Research Council (CONICET) and the Universidad Nacional de General San Martin (UNSAM). 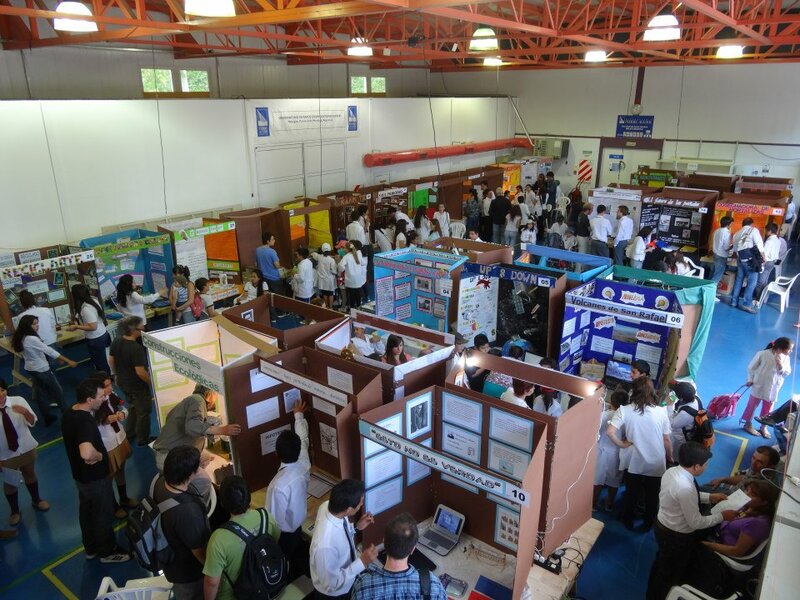 It is the first institute set up between two of the most recognized institutions in Argentina in the field of scientific and technological research, CNEA and CONICET. The aim of ITeDA is to research, develop and train qualified personnel in experiments and technologies associated with the sciences of the universe and astroparticles. and planning for the dark matter and neutrino Underground Laboratory, ANDES (Agua Negra Deep Experimental Site). These projects allow for a broad range of interactions between HAP and ITeDA with significant synergy potential. On 19/04/12 the IceCube Collaboration, in which members of HAP are involved, is published in Nature with the article "An absence of neutrinos associated with cosmic-ray acceleration in γ-ray bursts". Very energetic astrophysical events are required to accelerate cosmic rays to above 1018 electronvolts. GRBs (γ-ray bursts) have been proposed as possible candidate sources. In the GRB ‘fireball’ model, cosmic-ray acceleration should be accompanied by neutrinos produced in the decay of charged pions created in interactions between the high-energy cosmic-ray protons and γ-rays. Previous searches for such neutrinos found none, but the constraints were weak because the sensitivity was at best approximately equal to the predicted flux. Here we report an upper limit on the flux of energetic neutrinos associated with GRBs that is at least a factor of 3.7 below the predictions. This implies either that GRBs are not the only sources of cosmic rays with energies exceeding 1018 electronvolts or that the efficiency of neutrino production is much lower than has been predicted. One of the possible explanations of this absence of neutrinos, mentioned in the article is a recomputation of the underlying theoretical models, which has been performed for the gamma ray-neutrino connection on the same timescale by members of the Alliance's theory groups (Svenja Hümmer, Philipp Baerwald, Walter Winter), and which has been printed in Phys. Rev. Lett. 108, 231101 (2012) (arXiv:1112.1076v3) in the June 8, 2012 issue. Learn more here. On Jan. 27th, during the first workshop of Topic 3 - Dark Universe in Karlsruhe, Prof. Dr. Carlos Muñoz (UAM Madrid) Coordinator of the Spanish network Multi-messenger Approach for Dark Matter Detection (MultiDark) and Prof. Dr. Johannes Bluemer (KIT) Scientific Coordinator of the Helmholtz Alliance for Astroparticle Physics (HAP) signed a Letter of Intent, in which both partners expressed their desire to cooperate in their respective efforts to advance astroparticle physics in general and the search of Dark Matter in particular. 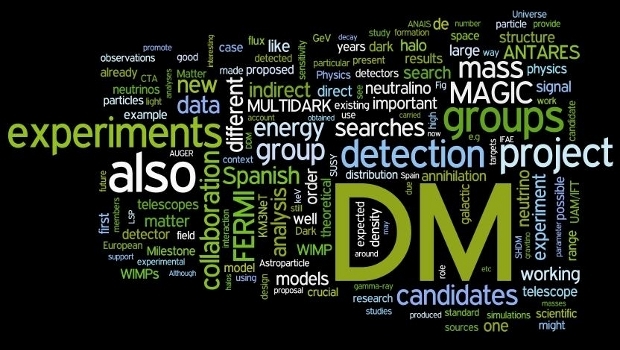 Multimessenger Approach for Dark Matter Detection (MultiDark) is an excellence project in which most of the Spanish research community working in the field of dark matter is involved. 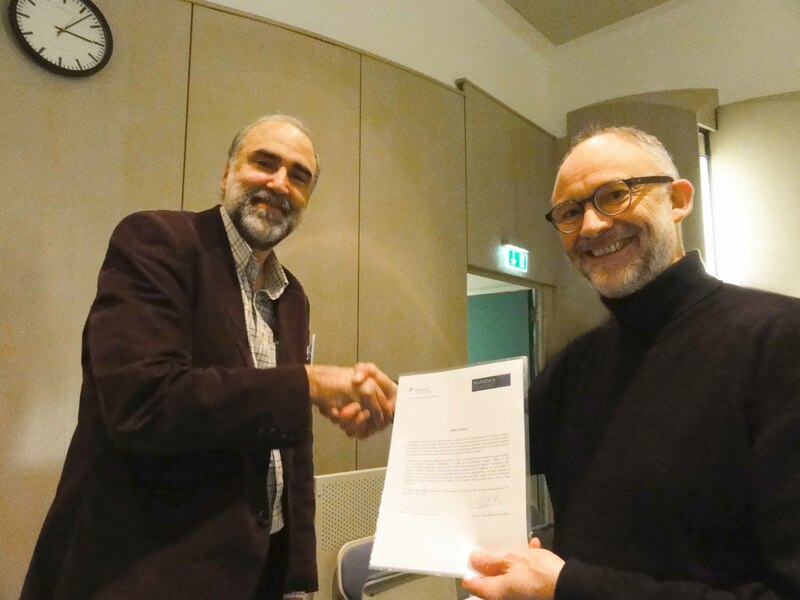 Earlier this month a proposal of cooperation between the TU Munich group E15 and the University of Zaragoza has been accepted by both HAP and MultiDark. It consists of a measurement of CaCO3 and WO3 samples at the Canfranc Underground Laboratory (LSC) for the CRESST and EURECA experiments.